Highest start for a climb in Southern California. Cycling Southern California’s Mt. Pinos: Start just off the top of the Grapevine. Start is through the pass at upper-middle of screen, road is at base of hill to left of photo. Mt. 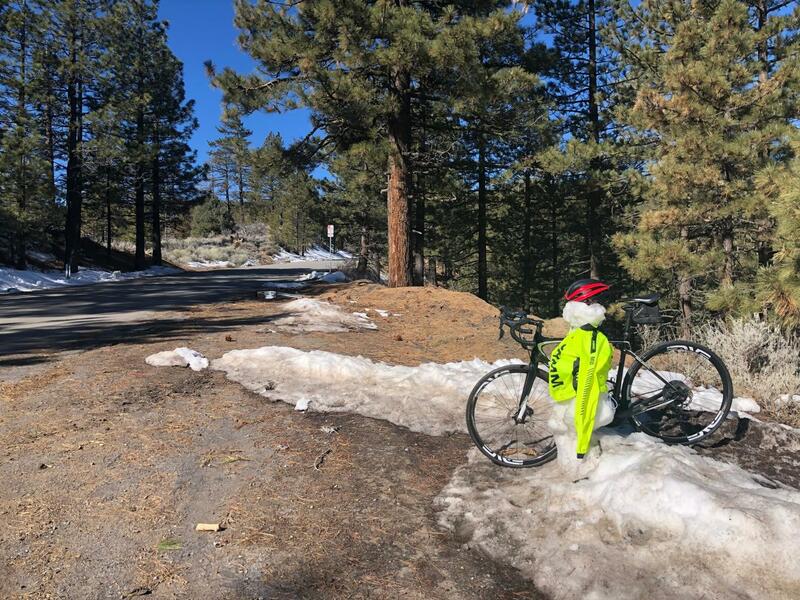 Pinos boasts the highest starting point for any Southern California climb (at 3,863') and the second highest finish point at 8,345' (just 98' below the granddaddy of So. Cal. finishes, Onyx Summit). As with so many of the incredible Southern California climbs, we begin in high desert surroundings (albeit just west of Tejon Pass at the top of the I-5 Grapevine). Enter Los Padres National Forest at mile 1.6. At mile 6.8, bend right onto Cuddy Valley Road and travel the remainder of the route to the northern end of the Chula Vista Campground parking lot. High desert landscape gradually gives way to a wonderful alpine setting around the halfway point of this climb. The climb ends at Mount Pinos Nordic Base. Photo taken at mile 8.5. The road to Frazier Park (mile 3.5) is moderately busy, but once you pass Pinon Pines Estates at Mile 9 you’ll have smooth sailing on a nice roadway into the forest with little traffic. The last half of this climb is very quiet as we ride through a peaceful alpine setting in the Los Padres National Forest. We love riding in Southern California during the winter! Climb ends at the Mt. Pinos Nordic Base. Aerial drone photo of roadway to Nordic Center (road runs right to left). Mt. Pinos boasts the highest starting point for any Southern California climb (at 3,863') and the second highest finish point at 8,345' (just 98' below the granddaddy of So. Cal. finishes, Onyx Summit).